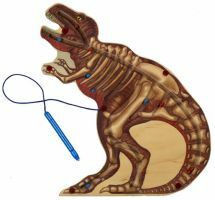 Introduce your kids to the awesome Tyrannosaurus Rex with the Magnetic Dinosaur Maze. Using the magic magnetic wand, they can guide the metal balls through his tail, legs, body, and head - just watch out for the sharp teeth! This toy will provide hours of fun, as well as improve your kid's eye-hand coordination, visual tracking and fine motor skills.